This is a gold leaved, slow growing, columnar shaped conifer, broadening to a conical shape with age. The spray like foliage is green-gold with dark gold tips, and is generally brighter yellow in summer. The eventual height of this gold conifer tree is about 3m (1.5m wide) so it makes a great medium sized feature conifer in larger borders or a good specimen tree for the centre of a lawn. 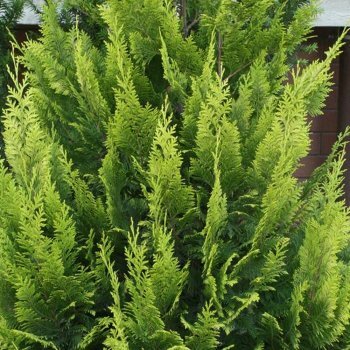 Sometimes referred to as Chamaecyparis lawsoniana Alumnigold, this variety is best grown in full sun or partial shade in any fertile, well drained soil. Our pot grown Chamaecyparis Lawsoniana Alumii Gold can be planted at any time of the year. Firstly, remove all weeds and grass within a metre of your desired planting hole then dig a hole as deep as your root mass and approximately 2x as wide. We recommend digging a square hole as this encourages the roots to grow straight as opposed to around inside the hole. To help your tree establish more effectively, we advise applying root grow (sprinkle in the hole for pot grown trees). Remove the pot, gently loosen the roots and place into the planting hole. If your soil is poor, mix 50% of the original soil with 50% high quality compost, fill in the hole and firm around gently. Make sure not to bank the soil up around the collar of the tree as this can cause problems. If you’re planting Lawson’s Cypress in spring, summer or dry weather, water well and regularly for the first few months. Keep an eye on young trees and increase watering if there are extended periods of hot or dry weather. If you’re planting in autumn, you may only need to water your tree a little. We also stock a range of irrigation kits, suitable for a variety of planting schemes. Once planted, keep the area free of competing weeds and grass for the first couple of growing seasons. Using a glyphosate based weed killer or installing mulch matting will aid in this. Do not simply mow the grass around the area as this will only encourage it to grow more vigorously. Conifer trees, such as Ellwood’s Gold, do not require a lot of pruning. Simply remove any dead, diseased or awkwardly placed branches as and when you see them.